Quality Early Childhood Teachers who are trained in child development and use observation to plan an educational program for each child. Staff who assist in supporting children's development through positive interactions based on trust and mutual respect. A warm, caring and safe environment that is designed to foster, support and enhance play. 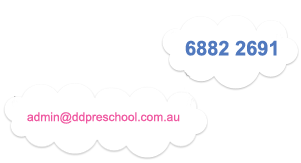 Dubbo and District Preschool offers before and after Preschool care. Each class is staffed by a qualified university trained Early Childhood Teacher and a TAFE trained assistant. In addition, extra staff are employed for all 3 year old and young 4 year old classes and provides additional help for children with special needs. In 2009 we were chosen as a pilot centre for the two year project "Kids Matter Early Childhood". KMEC is an early childhood mental health promotion, prevention and early intervention initiative with funding from the Australian Government. It was a great honour to be involved as one of only 110 centres across Australia. Through the training provided by the NSW Kids Matter facilitator the staff have gained a greater understanding of children's social/ emotional development and its impact on children's mental health.